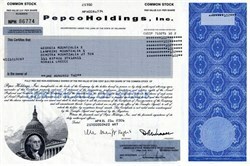 Home > Oil, Chemicals, Utilities > Power / Electric K - Z > Pepco Holdings, Inc.
Beautiful certificate from Pepco Holdings, Inc. issued. This historic document was printed by the American Bank Note Company and has an ornate border on one side with a vignette George Washington in front of the Capitol. This item has the printed signatures of the Company's President, and Secretary. Pepco Holdings, Inc. (PHI) is a holding company incorporated in February 2001 for the purpose of affecting the acquisition of Conectiv Power Delivery by Potomac Electric Power Company (better known as "Pepco"). The acquisition was completed on August 1, 2002 at which time Pepco and Conectiv became wholly owned subsidiaries of PHI. Conectiv itself had been formed in 1998 to be the holding company of Delmarva Power & Light Company (DPL, better known as "Delmarva Power") and Atlantic City Electric Company (ACE) in connection with the combination of DPL and ACE. In 2005, PHI resumed the use of the Delmarva Power and ACE brands for purposes of operations, with the result that Conectiv Energy was the only remaining Conectiv brand and was restricted for PHI's energy production facilities. Operations of the various companies controlled by Pepco Holdings take place in the Mid-Atlantic states of the United States. Pepco serves Washington, D.C. and its Maryland suburbs, Delmarva Power serves the Delaware and Maryland portions of the Delmarva Peninsula, and Atlantic City Electric serves South Jersey. In 2008, Delmarva Power sold its service area in the Virginia portion of the peninsula to A&N Electric Cooperative and Old Dominion Electric Cooperative for $44 million. In April 2010, Conectiv Energy was sold to Calpine Corporation. Pepco Holdings was placed at 283rd on the 2006 Fortune 500, a list of American companies ranked by gross revenue. In 2010, the company paid only 10% of the taxes it had paid in the previous year, dropping from US$104 million to US$11 million. The company experienced a doubling of operating profit in 2011, in part due to approved utility rate increases in the states of Delaware, Maryland, and New Jersey along with Washington, DC.